The Dubuque Camera Club display at the 2019 Dubuque Bald Eagle Watch. 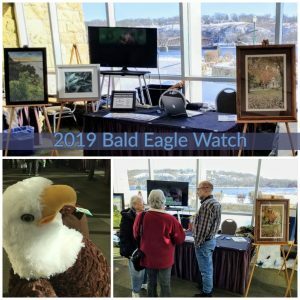 Despite a big snowstorm the night before, many people came to the 2019 Dubuque Bald Eagle Watch on Saturday, January 19, 2019 at the Grand River Convention Center in the Port of Dubuque. The event was sponsored by the Dubuque Audubon Society. The Dubuque Camera Club had a table in the vendor area during the Eagle Watch. A slide show displayed past submissions to the N4C Digital Nature category. Easels held a variety of other prints by club members. Printed copies of our brochure were available. Club officers Ron Tigges, John Leicht, and Ken Kiss promoted the club to attendees. Several other club members dropped by to chat. Birds, mammals, natural landscapes, and river scenes are favorite subjects of local photographers, so it makes a lot of sense to rub elbows with the area’s nature and conservation organizations. As residents of the beautiful Driftless Area, which offers a lot of photography possibilities, it’s important to build awareness so that future photographers can also enjoy the natural places. Thanks to everyone who came down to this event! This entry was posted in Nature photos. Bookmark the permalink.